Jeffrey Sachs, Director of The Earth Institute and Quetelet Professor of Sustainable Development at Columbia University; Special Adviser to United Nations Secretary-General Ban Ki-Moon and Director of the United Nations Sustainable Development Solutions Network. Nikhil Seth, Director of the Division for Sustainable Development, United Nations Department of Economic and Social Affairs (UN-DESA). Cassandra Dutt, Civil Engineering, Theater and Architecture major in the Integrated Degree in Engineering and Arts & Sciences (IDEAS) Honors Program, Lehigh University Class of 2013. Mark Orrs, Director and Professor of Practice, Sustainable Development Program, Lehigh University. We were discussing the challenges to sustainable development, with a focus on mobilizing and preparing youth to become problem-solvers for the issues that will define their era: economic well-being, environmental protection, and social inclusion. I wanted to share my contribution in todays blog. 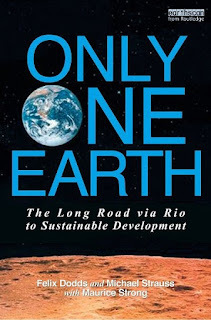 First - What is the legacy of Rio+20? Agenda 21 - a blueprint to what needed to be done for us to move to a more sustainable development path. It still is the best document produced in the UN as each section has a narrative based on Basic for Action, Objectives and Activities - I would if I had the chance make the structure mandatory for all UN documents. It also negotiated 2 conventions - the United Nations Framework Convention on Climate Change (UNFCCC), the UN Convention on Biological Diversity (CBD), the Rio Declaration and the Forest Principles. Not to mention set up the UN Commission on Sustainable Development and agreed to a new Convention on Combating Desertification to be negotiated within two years. In 2007 the UN CSD for the first time did not agree any policy in what was termed the Energy Cycle. Then in 2009 as we all know the huge failure of the Climate Conference of the Parties to the UNFCCC in Copenhagen - failed. By now sustainable development was dead. So what did Rio+20 achieve? Well I am sure many of you have heard all the negative press, which was often written by journalists or opinion makers who were not there. One of the vital meetings for Rio+20 was the Solo meeting where Columbia and Guatemala put on the table the idea of Sustainable Development Goals. NGOs and other stakeholders met in September 2011 in Bonn at the UN DPI 64th NGO Conference 'Sustainable Societies - Responsive Citizens', where I had the pleasure of the Chairing the Conference. It came out with a chairs text which put on the table for the first time a set of possible Sustainable Development Goals - 17 were put forward. The UN shared the outcome in their briefing issue briefings ensuring they were therefore put in front of governments. 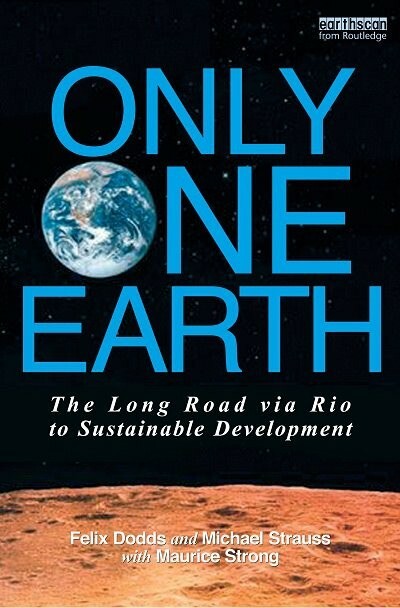 Rio+20 may go down as one of the most important conferences the UN has held. I could go over a number of its successes but i will focus on one, the agreement to have at the centre of any new global development goal framework the Sustainable Development Goals. This gives us a real chance to focus the political world on a small set of goals that will move us on to a sustainable path. This brings me to my second point: We need to focus on replicating solutions at the right level. If we are going to move towards living on this planet sustainably then we need solutions and that is why i am a huge fan of what Jeffrey is doing at the Earth Institute and with the recently set up Sustainable Development Solutions Network (SDSN) which will help mobilize scientific and technical expertise from academia, civil society, and the private sector in support of sustainable-development problem solving at local, national, and global scales. It has identified some ten key areas it plans to work on. The one I think is so critical is that of smart, healthy and productive cities. By 2030 urban areas in the developing world will triple and in the next 25 years in China 300 million people will move to cities that have yet to be built. Cities consume 75-80% of the worlds resources and produce 70% of the waste. Why is this important, it is because so many of is now live in urban areas and we can relate to the changes that are needed and be part of the solution ourselves. This makes it an enormously positive and empowering space. This then brings me to my final point - The need for empowering space for new entrepreneurs. Rio+20 was about economy - about how we create a more inclusive, fairer and greener economy. The world we live in today is one of interconnectedness and we have seen the way social media has had impacts on governments and companies and on elections. This generation is a network generation and one which by and large is more entrepreneur leaning than those of the past. In part this is also because of the nature of youth employment. What governments needs to do is look at ways to promote that Entrepreneurial spirit that many of us have. They can do that through a number of ways such as: appropriate education; through making it easier for people to try new ideas; through enabling funding through innovation banks which could be linked to knowledge banks. This generation is one that is acutely aware of what we are doing to this planet. Hurricane Sandy put climate change back onto the map. When you have Bloomberg Businessweek's front page saying "Its Global Warming, Stupid" then clearly its real. This generation and the next ones should be empowered to be the entrepreneurs working in the budding industries of the twenty first century and many of those need to be green.